A toddler has shown his apparent distaste for the British establishment by throwing a tantrum, first at the Queen and then at Prime Minister Theresa May after the unveiling of the Iraq and Afghanistan war memorial. 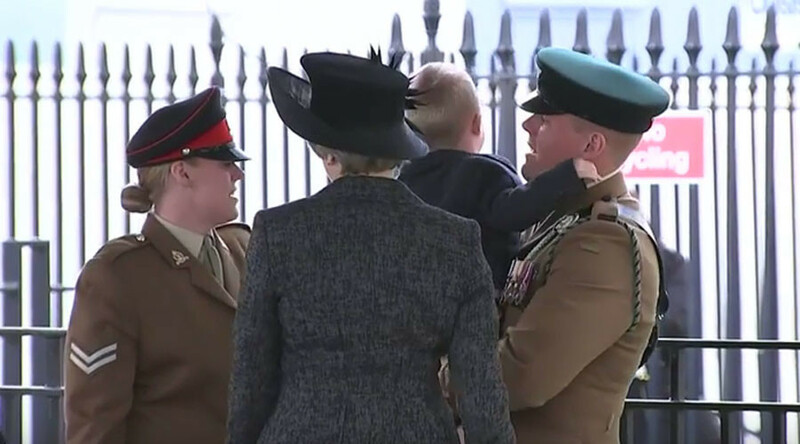 After the monument was revealed, the Queen received a bunch of flowers from the Lunn family - Serjeant Mark Lunn, 29, who was awarded the Military Cross for his actions during a fire-fight in Basra, his wife, Corporal Michelle Lunn, 26, and their two-year-old son Alfie. Alfie, held by his mother, is visibly upset as the Queen walks towards them. When the flowers are handed to the monarch, the little boy reaches out for them. He then wrestles himself out of his mother's arms and tries to run away. He can’t escape, however, and the boy continues to cry and scream as the Queen speaks to the couple. As May approaches, his tantrum appears to worsen. At one point the boy appears to relax and starts smiling, but when May attempts to speak to him his fit begins again. The memorial, dedicated to those who served in the Afghanistan and Iraq wars, was unveiled on Thursday. More than 800 UK military personnel and civilians died in the three wars. The sculpture, by Paul Day, is formed of two stone monoliths and a bronze medallion. Its unveiling in Victoria Embankment Gardens followed a service for 2,500 veterans in Horse Guards Parade.